Enjoy $2 craft beers at local bars and breweries! Craft Beer Passport helps you discover the best local bars and breweries and enjoy deeply discounted craft beer at each stop! Get to know the city–one neighborhood at a time–through its various craft beer bars and breweries. Collect stamps as you go to fill up your Passport app and keep track of your adventures! Official Craft Beer Passport Custom Sampler Glasses Are Here! As a proud partner of Craft Beer Passport we hope you've enjoyed using our beautiful tulip glasses while out on beer adventures across Toronto! You can now take them home with you right here from Zenan! Purchase your official customized 13oz sampler glasses today with the Craft Beer Passport logo. Bonus! Add your name or a message for free! Simply fill out the form below and a customer service representative will contact you. 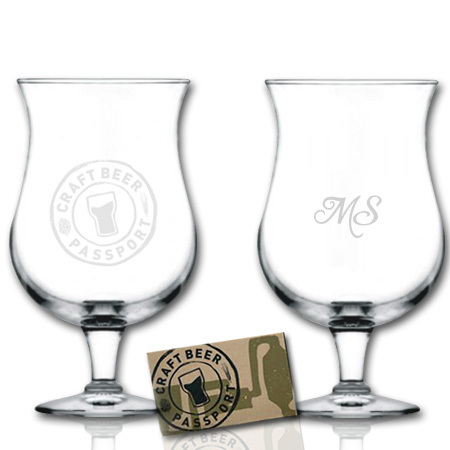 Decide on whether you would like your glass with only a Craft Beer Passport logo OR if you would like to customize with your name at no extra charge! Choose from 3 fonts of which you can create a name or a message up to 50 characters. Make sure you fill out all of the proper information and as many details as you can. We will complete your order through a customer service rep so don't worry if you are unsure of something. Payment will be made through Zenan Glass. Please let us know what font you would like on your glass. If you are choosing to have no customization, please choose the first option. Please type the first and last name of the person we are contacting. Please type your phone number for us to contact you. Please type the email for us to contact you at.